The 20th anniversary of NAPPY HAIR celebrates what started as a book celebrate a childs background and became the #1 banned book. Today NAPPY HAIR and it's author CAROLIVIA HERRON open up eyes and heart with the unique tie in of poetry, culture and passion to unite all people through the written and spoken word. She is a Black Jew and much of her writing stems from that heritage, she has also been named the “Grandmother of Hip Hop” as she was the first prof in the US to teach a course on hip hop - - - comparing it to ancient Greek epic. The natural tie in groups would be, Jewish Student Organizations, Social Justice, Black Student Union, early education and english. If there is a class on Hip Hop or a poetry club they too would be interested. For education majors there is a natural tie in with education, diversity and a reading of the book to exemplify call and response and the creation of poetry for students. Her first book, Thereafter Johnnie, has recently been identified as one of 100 novels that every Jew should read. Here is the link to the article. Her latest book, “Peacesong DC"
Carolivia Herron is the author of the much publicized children's story, Nappy Hair. A huge controversy occurred when a white teacher in Brooklyn, New York, was verbally accosted by members of the African American community for reading and sharing Ms. Herron's book with her class of African American and Hispanic children. 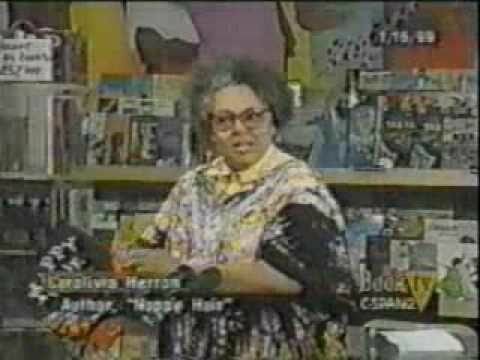 It was only after the media created a circus that the parents realized that Nappy Hair was a celebration of heritage. Nappy Hair, written in call and response style, enables young people to be active participants in living poetry. (Street to Street Epic Publications, 2014). performed by University of Cincinnati Camarata). course in hip-hop. (Harvard University, 1987). Songs, will be published by 2017. Award from Washington, DC Mayor Muriel Bowser.